2004 - The Year of the 31"
Back in June of 1980, I purchased a Meade 12.5" f/6 Research Series Telescope. This telescope has been the workhorse of the majority of my observations having been traveled around North Central and Central Ohio. In all, it is most at home here at the Warren Rupp Observatory. 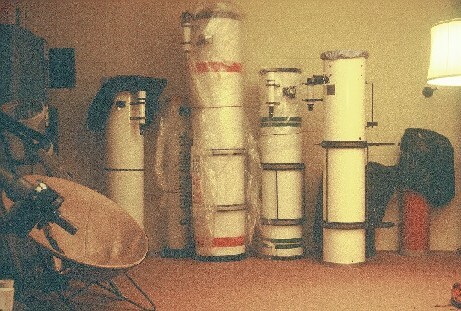 Here is the 12.5" telescope and some of the many places it has called home. Inspired by Mike Allen’s ‘Within 10 degrees from the pole’ I began an observing program to observe all the circumpolar NGC and IC objects. That is basically 40 degrees in declination from the North celestial pole for those of us in Ohio. Circumpolar objects are those objects that will never set from our northern latitude. As Mike points out in his article, equatorial mounts naturally have a tough time observing around the pole, which is why dobsonians are much easier to use than equatorials when observing objects at high declinations. However, I have found that observing close to the pole with an equatorial mounted telescope is very easy to do as long as you observe objects when they are close to the meridian. The meridian is a line running through the north pole, through the zenith and southward through the south pole. At the RA hour of the meridian (local sidereal time or ST), the Right Ascension (RA) axis is almost horizontal to the ground and the Declination (DEC) axis is parallel to the meridian. In this position, making small telescope movement in RA (east and west) along with telescope movement in DEC (north and south) is easy to accomplish even when doing so on top a ladder at the eyepiece. Even at extremely high declinations, equatorials are easily moved in RA by lifting or pushing at the tubes center of balance. Having RA and DEC motors with slewing capabilities would make this task even easier. Another essential requirement for all this to work very well is accurate polar alignment. To generate the list of NGC and IC galaxies within 40 degrees of the pole (listed in order by RA) is a very simple thing to do when using the DSO Utility in Megastar5. Within minutes, I generated 24 observation lists of galaxies by RA, one for each RA hour with declinations of 50 degrees and higher. Within each list, the galaxies are order by increasing RA further aiding in the search sequence by always working west to east. This is kind of like paddling a canoe up stream, you will observe the objects while they approach (or reach) the meridian hour (ST). The meridian is also the point at which the object will be the highest in the sky giving the best views possible. Eventually time will win out and you will have to jump ahead several hours to the east to catch the next list as it approaches the meridian. Using optical encoders connected to Megastar5 will aid in the location and identification of deep sky objects around and close to the targeted galaxy. With observing list in hand, displaying the actual FOV and RA/DEC offset of the next galaxy in Megastar5 made moving the telescope and finding the objects a breeze. After all, the telescope movement was basically entirely in DEC, with only a slight adjustment in RA. For those who have ventured into my Astronomical Observations will soon notice that all my visual observations are in some kind of a shorthand notation. This article will help explain where this notation derived from and how to read it. Maybe you too will develop some sort of variant of this code for your observations. · How many objects have I observed? · How many objects have I observed in Pegasus? · What objects did I observe on a given date? What telescope was I using? · Have I observed this object before? If so, what telescope, what eyepiece, what were the sky conditions, who was with me? · Which observations have companions or interacting members? 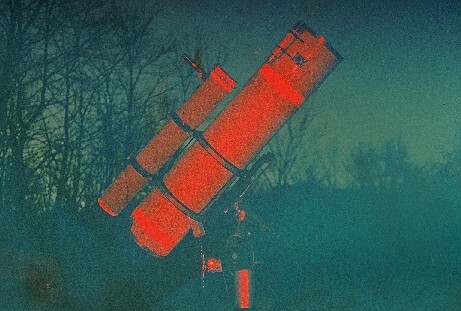 · What objects have I observed with the WRO 31” telescope? · How many NGC’s are in Aries and how many of them did I observe? Which ones have I not observed? As you can see, these questions can go on and on. No one at the time had an observing log system that could answer these questions. It would be years and would take advances in database software packages before this could be possible. Long before Megastar and TheSky, there was The Revised New General Catalog of Astronomical Objects (RNGC). It listed all the NGC’s in order by RA. In addition, it gave the object’s RA, DEC, type, size, magnitude and Dreyer’s visual description. I soon had every page copied, constellations identified for each object and each page placed in plastic covering. With 6” engraved setting circles on my new Meade 12.5”, I now had a powerful observing aid to take with me observing. I soon learned Dreyer’s description codes while hunting down NGC’s using the RNGC. Soon after, I found myself writing down descriptions of objects using my personal variations of his codes. One thing leads to another and soon I had observing sheets preprinted with fill-in-the-blanks Dreyer codes. The following web site will give you a full description of the Dreyer NGC codes http://www.dvaa.org/Dreyer.html. Now, I finally had a way to accurately describe visual observations in a consistent manner in about 20 characters or less. I could now use IBM punch cards and record most the relevant information for each object observed. The FORTRAN program soon was migrated to Basic and my observations were electronically printed by NGC order on a regular basis. These ‘flat files’ were kept on floppy disks and I continued to use the Basic program to keep recording observations. This method would answer some, but not all of the questions mention above. Not until the invention of Relational Database Management Systems (RDBMS) many years later was this observing program once again upgraded to the version it is today. The observations made over twenty years ago were preserved and easily loaded into the new database architecture. The success of preserving historical observations is greatly attributed to the following observational shorthand. This method is in use today and has undergone minor changes since it’s inception over 20 years ago. You will find this codes all throughout my observation logs. Each observation is described in a consistent manner. First the objects appearance as seen in the eyepiece (diffuseness, brightness and size) is recorded. A comma separates each attribute. Next, the objects shape is coded. Elongated, edge on, face on, round, etc. These codes can be used in any combination. Next detail description of parts of the object is recorded. Nucleus, dust lanes, arms, central bulge, surface brightness, etc. Again, these codes can be used in any combination. Finally, additional codes are thrown in to further describe the object. The description ends (observations after 2000) with a over all rating (R=) of either P (poor), F (fair), G (good), or E (excellent). Moderately faint, pretty small, patchy, uniform brightness, pair with pgc 59287, rating is fair. With a little practice reading these descriptions, you too might soon be writing visual descriptions using similar shorthand notations. To aid and facilitate your use and understanding of this notation, I have observation log sheets available so that you only need to ‘fill in the blanks’ or mark the appropriate code. The little horse has some big surprises if you have a moderately sized telescope. Tucked away and forgotten from it's bigger and more famous neighbors (Pegasus, Delphinus and Aquarius) Equuleus if often forgotten by many amateurs as they plan their nights observing session. And why not, Equulues only has 4 NGC objects and one of then, NGC 7045, is really just a double star. The other 3 are faint 13-15th magnitude galaxies and only one if these carries a Herschel designation (NGC 7046). In addition, there are only nine (9) IC objects. This makes the little horse the one constellation with the least number of NGC objects. Since it has no Messier objects, although the famous globular cluster M15 in Pegasus lies just outside it's Northwestern border by a mere 58', it is easy to see why amateurs swing their telescopes to its more promising neighbors. With all this negative publicity, why would anyone write an observing article about Equuleus? Eighty Eight reasons is why. Including the 3 NGC's previously mentioned, there is another 83 galaxies within the reach of large (12.5" and up) telescopes in this tiny constellation. Of the 88 objects I have observed in this constellation, 78 of these are brighter than 16 magnitude and the average magnitude of these galaxies is about 15.5. Since Equuleus is one of the smallest constellations, you won't have to go very far to find these galaxies. If you set out to hunt down these lonely objects, you will most definitely need a modern star chart or better yet, an astronomy software program such as Megastar. On September 23rd, 2003 I set the aim of the 31" Warren Rupp Telescope towards Equuleus. Armed with Megastar and interfaced to the optical encoders installed on the 31", I began to locate and identify objects I am quite sure are passed over by just about everyone. In just 2 days and 2 short observing sessions, I was able to record and identify 51 of these faint objects. Almost a year later, September 11, 2004, I finished the remaining objects during a single observing session. In total, 88 galaxies were observed in Equuleus. Many of these galaxies were worth the hunt. PGC 66150 and it's close companion PGC 66146 were outstanding in the 17mm Nagler T4. I was surprised these were not NGC objects. PGC 66085 and PGC 66079 were another pair falling into the same category as well as IC 5083 and IC 1364. I have observed many NGC galaxies that are much fainter and featureless than the many IC/PGC galaxies in Equuleus. Just because it is not an NGC object doesn't mean the object is not worth the look. Check out the objects observed in Equuleus and the visual descriptions of these objects by going to my Astronomical Observations page. In addition to listing actual observations of these objects, I can also list objects NOT observed. Referencing observations in the database, these lists can be expanded to objects observed and objects not observed for all of these observing lists. I can now printout and plan the nights observing session while working on various observing projects. In addition, for each observing project, I have generated observing lists for public use. These Astronomical Listings are sorted by catalog number and Right Ascension. Just download and print. To further aid an observing project the database can generate files (observing lists) that can be used by Megastar. The generation of these observing lists also ‘flag’ objects that have been observed. Using Megastar, these ‘flagged’ objects in observing lists can be plotted in any color of your choice. Now, you can visually identify objects observed and not observed in Megastar for the observing list. With Megastar interfaced to encoders on your telescope, one can easily guide the telescope to the next object on your list that you have not observed. It has always been my personal goal to observe all the NGC and IC objects. Realistically, this is a task that will most likely never get accomplish unless I move or observe from locations farther south. However, using my Astronomical Observations database, I can generate a variety of observing lists (projects) much smaller in scope and easier to accomplish. This was first done by grouping the NGC objects by constellations and then treating each constellation as an observing project. With the addition of the Revised IC catalog, my ambitions changed to include all NGC and IC objects. To accomplish this seemingly impossible task, I once again turned to observing projects. In addition to NGC and IC objects by constellation, I added the circumpolar project, all NGC and IC circumpolar galaxies. Since the Herschel objects are NGC objects (all 2500 of them), I added a Herschel 2500 project. This was further broken down into the Herschel 400 (I) and Herschel 400 (II) projects which are objects defined by the Astronomical League. The Messier project was the easiest and first project completed. While I continue to work on these projects, I would observe PGC and other non NGC/IC in the vicinity of the primary target, thanks to Megastar and optical encoders which made location and identification of these objects possible. Observing sessions had purpose and at the end of the evening, work was getting accomplished. With the addition of encoders and Megastar to the 31” telescope, the visible universe has expanded to about 18.5 magnitude. Not only are NGC and IC objects easily detectable, the database has expanded to UGC, CGCG, MCG, VV, ARP, HICKSON, PGC, MAC, etc. galaxies. And if you wondering, I am not going to attempt to observe all 75,000 PGC objects! I have generated observing projects for Abell Galaxy Clusters, Hickson Compact Clusters, Webb Society's Anonymous Galaxies and ARP Peculiar Galaxies. Each of these projects contain anywhere from 120 to 700 objects brighter than 18.5 magnitude. More projects will be added in the future, enough to last several lifetimes. To view my observing projects mentioned in this article, visit the following address: http://www.scodova.wroras.org/observations.html. If there is a particular observing project you would like to work on, let me know and I will generate the list for you. In the future, I plan on making my Astronomical Observations application available on the web. The application will be modified so that registered users can enter their own observations, etc. and generate and track their own projects. With internet access at the observatory, one could enter their observations and generate their lists while at the telescope! The first major update to the DSO observation database and application took place during the months of April, May and June 2006. Using Megastar and several public database sources on the internet, I have expanded the capabilities of the DSO application. One of the major updates that took place was the expansion of the database to include the entire PGC catalog. In addition, cross-referencing by catalog for each object was implemented. This is easily visible in the Alias/Notes column on all generated reports. There is now over 66 thousand objects in the DSO database. With the addition of the PGC objects, observation lists have reached a new level. Not only do I have observational lists for my personal observations, I have generated observation lists for public use. There is now observation lists for ARP Peculiar Galaxies, Hickson Galaxy Groups, Caldwell Objects, Webb Society Anonymous Galaxies, the best Abell Galaxy Clusters, Herschel 400 (I, II and 2500), Messier and NGC/IC by constellation plus much more. To aid the amateur astronomer, each of these lists are generated by Right Ascension (RA) order and by Catalog/Number order. For example, the Messier lists are generated by RA and Messier number. The ARP Peculiar Galaxies lists are by RA and ARP number. All these observation lists now include cross-referencing catalog entries. You can access these observation lists here and from my Astronomical Observations page. Go ahead, spend a little time looking over these observation lists. You will not find a single source on the WWW today offering such a variety of observing projects. I was approached by Jerry Beck about the possibility of having an observing project for the Webb Society Anonymous Galaxies. Well, here it is. In 1987 the Webb Society put together a list of 165 galaxies in their Deep-Sky Observer's Handbook Volume 6 titled "Anonymous Galaxies". In it, you will find visual descriptions and field of view drawings of 165 galaxies made by amateurs with medium (12" and up) and larger aperture telescopes. These galaxies should be fairly easy to find because of their close proximity to brighter NGC and IC objects. Since 1987, some of the objects listed have been re-classified as NGC objects and the 'unidentified' objects have found their way into the Mitchell Anonymous Catalog (MAC). I have put together this observing list using the NGC, PGC or MAC catalog designation rather than UGC, CGCG or other designation used in the Webb Society handbook. This was done to conform to my naming standard used by my Observational Database and to limit the number of catalog designations. There are over 125 different catalog listings for galaxies. You will find the Webb Society Anonymous Galaxies observing project on my Astronomical Observations page. There you can view Anonymous Galaxies observed and the visual descriptions of these objects. Here is the complete list of Anonymous Galaxies that you can print for your observing sessions. If you haven't figured it out by now, Galaxies are my favorite deep sky objects to observe. With so many of them accessible through medium and large sized telescopes, one can easily become overwhelmed. Since quality observing time is limited here in Ohio, it is important you plan the nights activities before beginning your observing session. This observing project will surely award those with modest sized telescopes and above average observing skills. The Hickson Compact Galaxy Group is a collection of 100 compact multi-galaxy groupings. This list was compiled by Paul Hickson and published in his Atlas of Compact Groups of Galaxies in 1994. They represent the brightest groups visible to northern observers and make ideal targets for amateur astronomers. It includes one of the best compact groupings - Stephan's Quintet. The idea to develop this observing project came by way of the article 'Crashing Galaxies' in Sky & Telescope, November 2004. This observing project will surely challenge your observing skills and provide additional meaning and purpose to time spend under the stars. You will find the Hickson Compact Galaxy Groups observing project on my Astronomical Observations page. There you can view Hickson Compact Galaxy's Observed and the visual descriptions of these objects. Here is the complete list of Hickson Compact Galaxy Groups that you can print for your observing sessions. Dr. Halton C. Arp compiled a list of unusual or peculiar galaxies and interacting pairs of galaxies using photographs from the Palomar 200 inch telescope in 1966. In total, 338 Arp objects (individual galaxies and groups of galaxies) were identified totaling about 630 galaxies. For more information about Dr. Halton C. Arp and the Astronomical League Arp Galaxy Club visit the following link: http://www.astroleague.org/al/obsclubs/arppec/arphalt.html. After upgrading my astronomical database and application with the entire PGC catalog, I generated an ARP Peculiar Galaxy observing project. In March of 2006, I began using these lists to observe ARP galaxies. In addition to my personal observations and list of objects observed or not, you can download and print out your own ARP Peculiar Galaxy lists by Catalog Number and by Right Ascension order. How many ARP Galaxies can you observe? In November 2008, I received my Astronomical League ARP award. The year 2003 marked a record year in observing Deep Sky Objects. The year began observing primary with the Meade 12.5” and ended with the 31”. The most memorable observing sessions was the week of June 21st where I was able to observe 6 of 7 nights (5 in a row) under great sky conditions. 327 DSO’s were logged in that week. The year ended with a wonderful Christmas present from Mother Nature on the night of December 26th. On that night, 105 objects were logged. However, the single night DSO record was set on September 25th when 134 DSO’s were logged. There was no Messier Marathon in 2003 due to typical Ohio weather. In fact, only 4 observing sessions were conducted in January, February and March. While many nights may have been clear around Full Moon, I only attempt observing sessions 4-5 days either side of New Moon. The year 2003 is now behind us and I am one who likes to look ahead. I am expecting 2004 to be another record breaking year. Although not a record setting year as 2003, the year 2004 will go down as the year the 31" Warren Rupp Telescope came to life. After years of tinkering with the 31", finally something that works very well got implemented. Drives, optical encoders, wireless RS232 communications, Megastar and Argo Navis all together provide the observer with various choices using the 31". The Beast is tamed and I can tell you this from experience. The scope is a joy to use and observing from atop the lift has never been so comfortable and enjoyable. Anyone with above average observing skills should be able to utilize the telescope's full potential. There is no longer any excuses just a lack of 'true' desire. In 2004, only the months of July, August and November saw no observing sessions most likely due to bad weather. Keep in mind that I only attempt observing sessions 4-5 days either side of New Moon. Still, with 19 observing sessions, many observing projects were completed. Completed were all the NGC and IC objects for a number of constellations. What started back in the mid 80's saw finalization in 2004. The power and usability of the 31" made closure of these observing projects possible. Armed with Nagler 2" eyepieces, the visual experience reached the apex. For DSO's, especially galaxies, the Nagler 17mm Type 4 (324 power) is the eyepiece of choice. 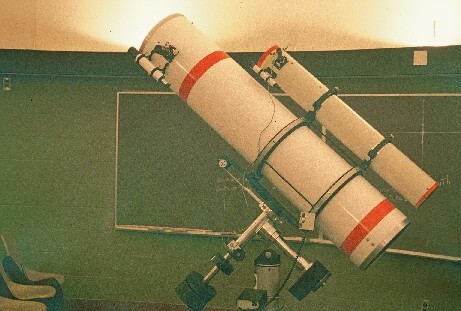 For Messier objects, the Nagler 31mm Type 5 (178 power) provided the 'best ever' visual views. I have never seen Messier objects this spectacular ever in my life. The first (that I know of) guided time exposure of a deep sky object was made in 2004. The experience gained through taking the photograph spawned yet additional improvements that will carry into the 2005 year. Hopefully, auto-guided CCD images will soon be possible with the 31" but for now, I'll settle with the 'old fashioned' manual guiding with off-axis guiders and film. The only problem I have with astrophotography is that it takes time away from visual observation! The 31" telescope is showing it's potential as a serious astronomical instrument. I hope the year 2005 will offer us amateur astronomers many opportunities to enjoy the heavens. And when it does, I hope to see you out under the stars too. 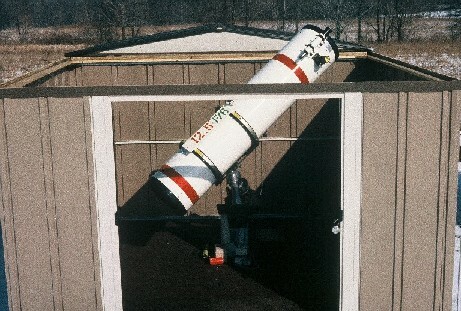 The 31" telescope is a serious astronomical instrument. I hope the year 2006 will offer us amateur astronomers many opportunities to enjoy the heavens. And when it does, I hope to see you out under the stars as well. Clear skies and I hope to see you under the dome. Let's hope 2008 will offer better observing conditions. Lets all hope we do get some change in 2010....the right kind of change. The 31" WRO mirror came to an end in 2011 when the secondary mirror fell onto the mirror. The date was 9/13/2011. John Neumann was the last person to observe through the 31". On 9/1/2011 John observed PGC 66538, a galaxy in Vulpecula. As for me, there were no DSO's logged during 2011. Not only bigger, but better! The Bigger Blue 36" made it's big splash one week before Hidden Hollow 2012. With new outside dome paint and a new 'blue' telescope paint job, the 36" mirror and new mirror cell amazed those in attendance. As for me, I picked up where I left off 22 months ago. My first logged DSO was 2 members of Hickson 99 (PGC 57 and PGC 60) on 8/17/2012. Between 8/17 and 12/31/2012 I logged in 645 objects. Every year around early spring, amateur astronomers have a rare opportunity to observe all the Messier objects in one night. If you are located around 40 degrees North latitude, you too will have the opportunity to observe 109 of the 110 Messier objects. For observers around 25 degrees North latitude, your chance for all 110 Messier objects greatly improves. For the 2010 Messier Marathon, the best dates will be the weekend of March 13th. New moon is March 12th. March 27th is the optimal date for the Messier Marathon. Increase your chances by making sure you have a good western horizon for the early evening objects and a clear view of the southeast horizon for M30. This year, I plan on using the 31" for the Messier Marathon. The 31" combined with the 2" 31mm Nagler will surely make this years marathon most unforgettable. For many years, the weather has prevented a Messier Marathon only providing excellent opportunities from time to time. On March 27, 1981 I was able to observe 108 of the 110 Messier objects missing M74 (the first object) and M30 (the last). The third quarter moon on that morning interfered with M30 sitting low in the southeast. In 2004, 109 of 110 objects were observed over 2 observing sessions on March 19th and March 22nd. Clouds prevailed in 2005. In 2006, the official Marathon date was clouded out, however clear skies on other dates gave John Neumann the opportunity to observed most of the Messier Objects using his 8" Telescope. In 2007 and 2008, no Messier Marathon was attempted. In 2010, John Neumann observed 103 of 110 Messiers using his 12" dob on the night of March 8th. This is really good considering he was 2 weeks before the optimal date. I have an observing log sheet pre-filled with the Messier sequence you can print and bring with you when you observe. The article Reading Observational Shorthand will assist you in using the Dreyer like codes. In addition, here is the Messier sequence with additional data regarding each Messier object. I wish you success and clear skies for this year's Messier Marathon. Currently in the works are Leo (572 objects observed to date), Virgo (313 objects observed to date). You can access all my astronomical observations at the top of this page. Stay tuned for future updates.